Places I've Eaten: SINGLE SERVING: SAFEWAY WAFFLE BREAKFAST SANDWICH...YES, SAFEWAY! To be honest, anything that starts with waffle sandwich is gonna attract my attention. Safeway has been making sandwiches and breakfast sandwiches for some time now, I just never really thought about getting one till I was waiting at the hot bar to buy a corn dog (yes this is the no judgement zone still!) and just happened to glance over at their sign and saw the listing for waffle breakfast sandwich. Thus it was I found myself there the next morning ordering one up. Basically two waffles with your choice of egg, meat and cheese. I decided to go a little different and get the sausage instead of bacon (I know, shock, right?) and chose cheddar as my cheese. All for the not so princely sum of $2.99. They make these to order, but I'm not sure that makes a difference here. 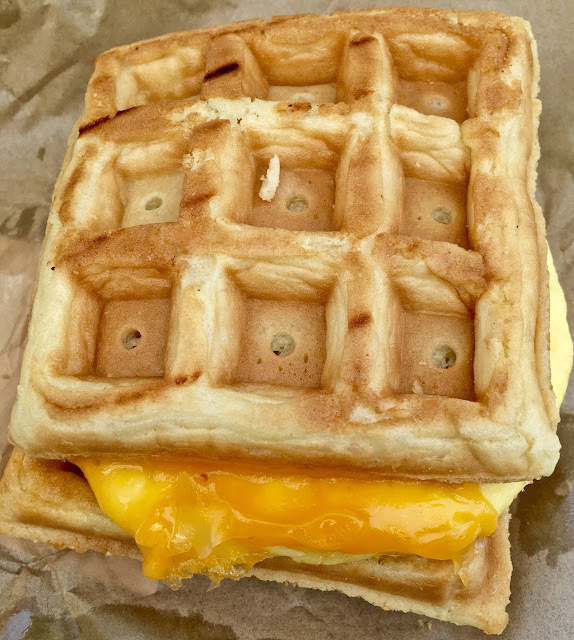 The waffle, the egg, the sausage were all pre-made, possibly frozen items that they stack on each other then stick it in a silver box that looks like a microwave but really isn't. I'll say it is somewhere between a steamer and a convection oven type thing. While it does heat things up enough to melt the cheese, it doesn't do the waffle any favors. It doesn't crisp the waffle up but instead makes it soft like bread--a soft spongy bread. Once the pieces are all heated the lady behind the counter asked if I wanted mayo or mustard. I was a little, um, yuck no. And asked if they had any butter. She said no. Ugh, I was like fine then just as is please. She said no lettuce or tomato? She was treating it like any old sandwich. Who knows, she's probably been making these for years and has seen it all and is used to people adding as much as they could to this. I think the fact I didn't want anything on it kind of threw her. She said are you sure? I said yes and did ask if they had any little syrup packets or something I could dip it in. Again the answer was no. No butter, no syrup, no other breakfast condiment like jam or jelly either. This was unfortunate as with all the pre-heated things and they spongy waffle the whole sandwich came off dry. I think had there been butter on both sides, I could have looked past the soft waffle and said, eh, for the price, it was good enough. But seeing as how they neither had nor offered anything beside mayo and mustard, I'd pass on getting this again. Unless of course that is your thing and you want to make this like a lunch time sandwich with all the fixings. That is totally within your right, but for me, no, even if the waffle was crispy. 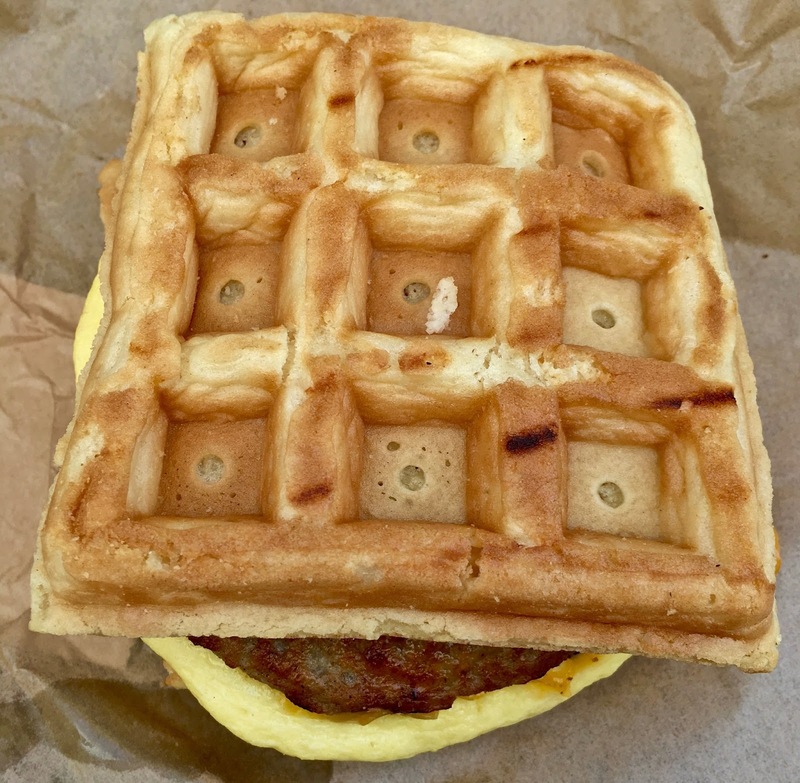 While I wasn't expecting to be wowed by a waffle breakfast sandwich, I think I did have some small hope it would have been decent enough for the price to get in a pinch kind of thing. As is, I can't recommend. The sign said these were for a limited time, though that time seems to have been a month so far. One other person in line was getting one of these too and they made it the same way so everyone gets soft waffle. Everyone else in line was getting a breakfast burrito. I'm guessing they already knew something I didn't and were getting the better of the two choices. Oh well, live, eat and learn. My breakfast sandwich journey continues.